•In a small skillet, saute onion in 1 Tbsp. oil until onions become slightly soft. Stir in cumin, cayenne, and chili powder and saute an additional minute or two. •Transfer seasoned onions to a small crock pot. 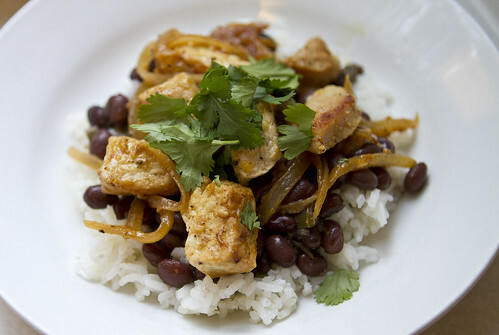 Add chicken broth, cilantro, lime juice, pepper and pinto beans to onions and simmer on low-heat for at least 2-3 hours. •In the meantime, combine taco seasoning and paprika. Brush chicken with oil and rub with taco seasoning/paprika mixture. Grill chicken over medium-heat until cooked through, try to turn only once during the grilling process. After cooking on one side, flip chicken, add small amount of water to pan and cover. Remove from grill. Let rest for 10 minutes and shred. 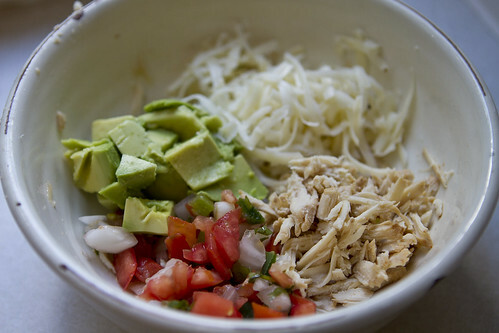 •In individual bowls layer chicken, about 1/3 c. pico de gallo or salsa, 1/3 c. diced avocado, and 1/3 c. pepper jack cheese. Ladle about 1 cup of chicken broth directly over the layers. 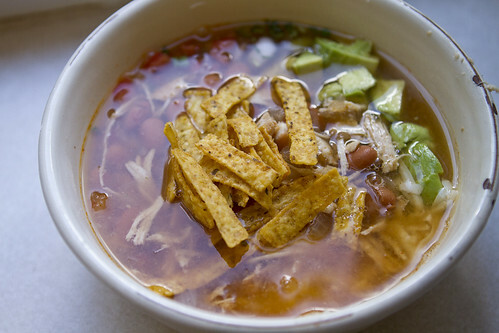 Top with tortilla strips and garnish with cilantro, sour cream, and lime wedges, if desired. Can I just say that is one of my favorite food pictures?! I love it when a dish photographs so well, especially if it was tasty, because I know people are more likely to try it! This meal, which I saw on The Daily Dish, had been on menu for a few weeks and kept getting pushed off over and over again for one reason or another. I am so glad we finally made it though, Mike and I loved it! I bought a can of black beans with jalapenos and lime juice and the spiciness of those with the sweetness of the pork was a perfect combination! 1. Use a fork to pierce the pork tenderloin (this will help in the marinating process), and then cut the tenderloin into two-inch chunks. 2. In a large ziploc bag or glass container, combine the pork chunks, onion, garlic, the juice and zest of half of the orange (set the other half aside for now), the lime juice, 1 tbsp of olive oil, and salt & pepper. 3. Once the bag or container is sealed, shake up the ingredients to mix them all together, and refrigerate for a minimum of 30 minutes. (Note: the longer you let the meat marinate, the more flavorful it will be). 4. In a large pot, heat the remaining tbsp of olive oil over medium-high heat. 5. Using tongs, transfer the pork (only!) to the pot. Leave the onions aside for now. 6. Cook the pork chunks for 3 to 4 minutes on each side, or until they turn golden brown. 7. Remove the browned pork from the pot and onto a plate. 8. Add the onions to the pot and cook for a few minutes, or until they start to lightly brown. 9. Then add the pork back into the pot and stir together with the onions. 10. Add 1/3 cup of water, the remaining juice of the orange, and another lime's juice to the pot and once it begins to bubble, cook the pork and onions covered for about 15 minutes. 11. Serve and garnish with orange and lime zest, lime wedges, and cilantro (optional). You may have noticed I have not been posting as frequently here because it is my busy season with photography. Because of that we have been doing lots of old favorites, super simple stuff or take-out. I have still been trying to mix in a couple new things a week though, because I really do love to try new things, and I have been searching for healthy crock pot meals. 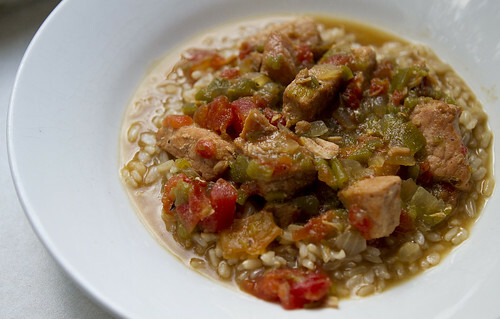 Skinnytaste is always one of the first sites I visit and that is where I found this YUMMY stew. I absolutely loved the flavors! Definitely my favorite new recipe in a long time. Heat a large non-stick skillet on high heat; when hot lightly spray the pan with oil and brown the pork over medium heat on all sides, about 3 - 4 minutes total. Sprinkle 1 tbsp of flour over pork and stir to cook 30 seconds, sprinkle remaining flour over pork and cook an additional 30 seconds. Cook on LOW for 8 hours or HIGH for 4 hours (if using a Dutch oven, cook on low heat for 3-4 hours). When done, adjust season, salt and pepper to taste if needed. *Weight after all fat is trimmed. I had this on our menu for dinner during the week and then ended up needing a breakfast item for a dinner with family so I made it for that. We cut it into 10 pieces, which were pretty small, but with all the other options available it was fine. I think if this is your main dish, it probably would serve 4-6. It is healthy, easily adaptable to make it gluten-free and was pretty tasty too. It was another winner from Skinnytaste! Preheat oven to 400°. Lightly spray a pie dish with cooking spray or your misto. 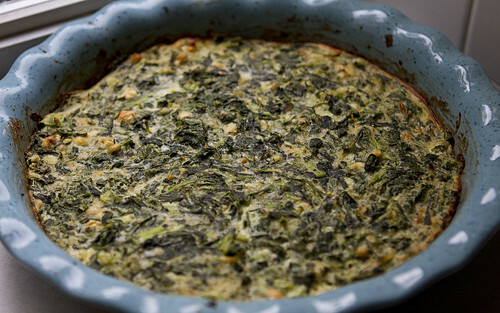 Mix spinach, scallions, dill, parsley, feta cheese, and in the pie dish. Sift flour and baking powder in a medium bowl. Add remaining ingredients to the bowl and blend well. Pour into pie dish. Bake 28 to 33 minutes or until knife comes out clean from the center. Let it stand at least 5 minutes before serving.